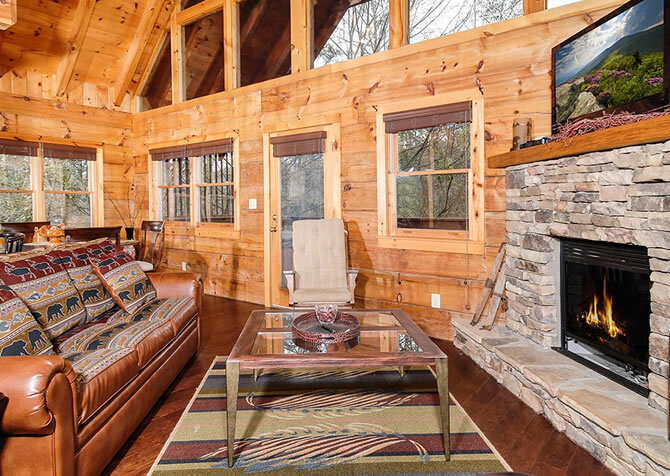 A blend of modern amenities and rustic mountain charm, American Dream is a cozy Pigeon Forge perfect for rest and relaxation. 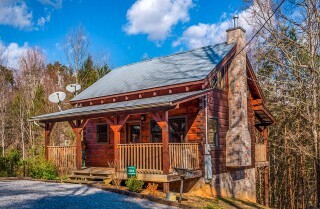 This 1-bedroom, 1 1/2-bathroom cabin for 2 is a romantic space where you can make your own meals in the fully equipped kitchen, unwind in the jetted tub by the comfy king-size bed, kick back on the couches in front of the inviting fireplace, sip coffee on the porch, or have a romantic night in the hot tub on the deck. Perfect for an extra-special birthday, anniversary, honeymoon, or “just because” weekend in the Smoky Mountains, American Dream is also convenient to the hundreds of attractions in downtown Pigeon Forge and Gatlinburg - meaning easy date nights! Spend days playing at Dollywood, strolling through Ripley’s Aquarium, or listening to live music and tasting moonshine - 2 classics in the Smokies. Lay your bags at the door and settle into one of 2 large leather-and-fabric couches to soak in the beautiful space that is yours for the next few days. You will be so excited to finally pop open a bottle of that special red or white wine you have been saving for a special occasion and set your glasses on the long wooden coffee table before even unpacking. 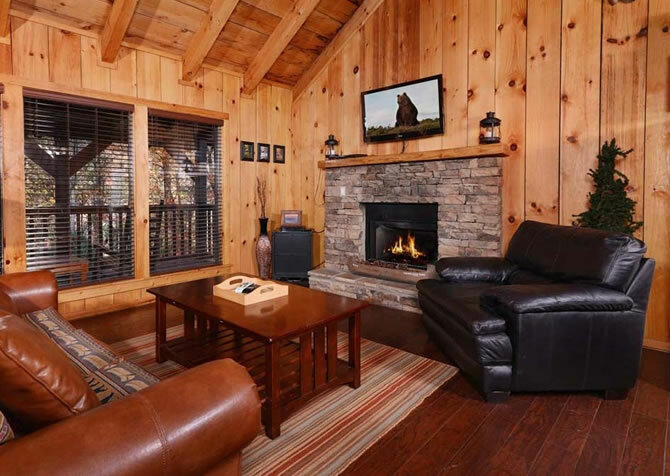 After days of sightseeing in the Great Smoky Mountains National Park, enjoy nights of relaxation in front of the fire in the stacked-stone fireplace. Bring your favorite movie to pop into the DVD player for a movie date so much better than the theater. Walk over the soft shag rug and melt into the smooth leather reading chair next to the window that’s the perfect spot to finally finish that book. Most importantly, spend time reconnecting with your loved one in the romantic atmosphere on the couches under the lofty ceiling. 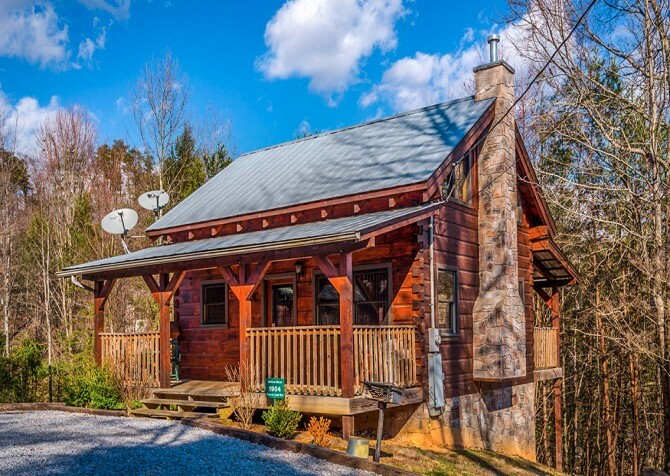 Really “wow” him or her with a delicious homemade meal from the quaint cabin kitchen with its natural wood cabinetry and smooth granite countertops. Grab your pots and pans from the cupboards for the meal prepping process and find all the necessary cooking utensils and cutlery next to the stove as you put together a special dinner for an anniversary. You can even order a romantic candlelit dinner (ask when you book the cabin), with all the ingredients waiting in the cabin upon arrival. If cooking is not your forte, there are plenty of unique dining experiences such as the superbly Southern Dolly Parton's Stampede dinner show in Pigeon Forge. Bring home leftovers to keep in the refrigerator to heat in the microwave for an easy meal the next day. No need to worry about finding a nearby coffee shop for your cup of morning joe; simply brew a cup in the kitchen before enjoying a charming breakfast on the patio or breathing in the morning mountain air in the rocking chairs on the back deck. The delightful dining set for 2 is just the right size for that intimate, romantic dinner. Did you make a large meal and need more room? Or playing a board game and need more space? Simply flip up the extension wings for a round, spacious place for more space for plates or games. Have breakfast sitting on the table before your partner comes downstairs so you can eat and be on your way for your day of shopping at The Island and seeing the sights of Gatlinburg from the sky lift. Take in some fresh air and morning sun while you dine on the second dining set on the front porch for a pleasant way to begin the day of horseback riding, hiking, or ziplining. Take a nap in the dreamy afternoon sun on the large Simmons Beautyrest pillowtop king-size bed in the loft bedroom after a morning hike in the Great Smoky Mountains National Park. The overhead fan provides the perfect breeze while you let your mind and body rejuvenate far away from home and daily responsibilities. Grab a few of the pillows and get comfortable for watching some TV from bed while your partner reads under the faint light of the reading lamp. 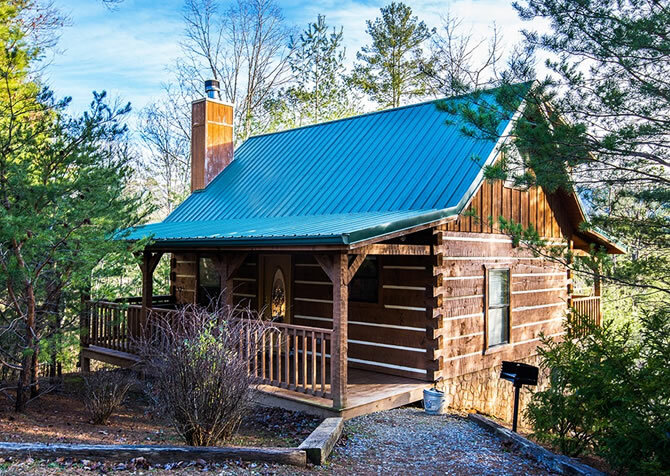 With plush pillows, smooth bedding, and the conveniences of home, waking up each morning will be like a stepping into cozy mountain cabin dream. Get showered and ready for the day in the conveniently close bathroom with subtle daylight pouring in from the window for a refreshing start. Rock slowly back and forth in the rocking chairs on the back porch as you reminisce over the years of your relationship while sipping hot chocolate and studying the rays of sunlight passing through the forest. Sip on wine you were able to taste and enjoy at the award winning Smoky Mountain Winery while you laugh and talk about the sights of Gatlinburg from the front patio dining table at dusk. At the end of the evening, grab a couple towels and climb into a soothing hot tub to release tension and ease sore muscles before heading to bed. Soak in the serene views of one of the most visited areas in the Smoky Mountains. Sprawling valleys are set with a majestic mountain backdrop, adored on a drive through the 11-mile loop of Cades Cove. Watch for wildlife, explore historic churches and homesteads, stop for a picnic, and dip your toes in a quiet mountain stream! Gatlinburg’s oldest winery, Smoky Mountain Winery, is home to some of the most flavorful and well-crafted wines in the region. With hundreds of award-winning wines to their reputation, free tastings, and free tours, this is an experience perfect for a day-date while out shopping in Gatlinburg. Take home a bottle of your favorite and visit the in-house gift shop to pick up some souvenirs or commemorative wine glasses to use for your romantic dinner in the cabin! Want a unique dinner show you can only see in the heart of the South? Watch acrobats fly through the air, Southern belles serenade you, and trick riders glide on horseback through rings of fire during the amazing dinner show at Dolly Parton's Stampede! Come with a hearty appetite, because your show will be served up with a 4-course meal! ""This cabin was so clean inside and outside. It was also very cozy and romantic. The staff was so helpful and friendly. We would love to come back and stay in the same cabin. I will recommend Cabins For You to all my friends and family and the Military that I work with." "My husband and I love Cabins for you! We originally decided to treat ourselves to a special trip for our 15th anniversary. We have come back for every anniversary since! Each cabin we have visited has been wonderful! American Dream was no different. 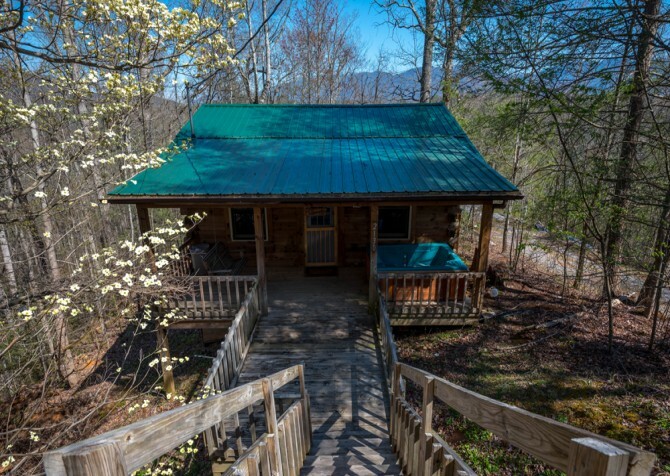 It is perfect for two with two rocking chairs on the covered front porch and a bistro set for two along with a hot tub on the covered back deck. 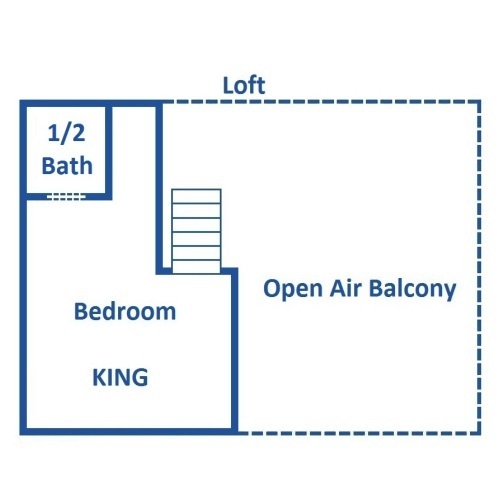 The loft has a king size bed, TV with VCR and DVD player, jetted tub in the corner and a 1/2 bath. The living area has a couch, love seat and rocking chair all centered around a stone hearth fire place and big, flat screen TV! 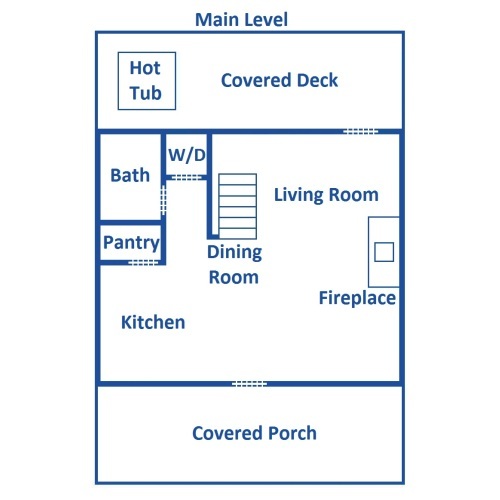 A full kitchen with dining table for two, a full bath and washer and dryer. Cell phone and internet service are great here. The cabin shares a driveway with two others so you may have neighbors. American Dream is located at the end of the drive and the back of the cabin is surrounded by trees, so if you're like me and enjoy some privacy you can still have it, neighbors or not :) It is about 10 milles from Pigeon Forge so you are close to all the attractions."